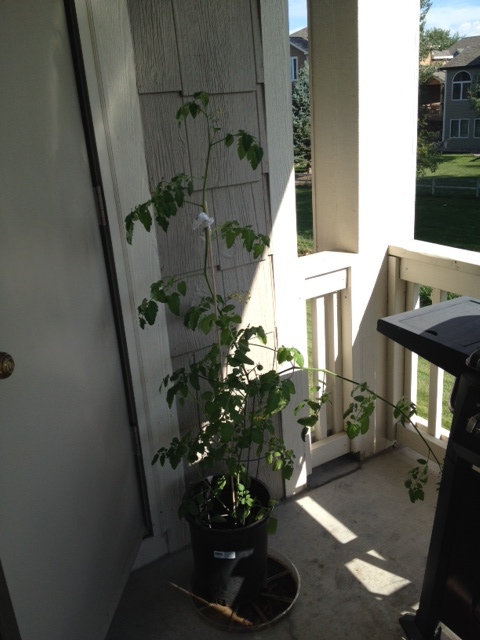 Look at my tomato plant! This little guy is growing. I can’t believe it. And to think my mom just started it from a seed. She’s a little jealous since I am growing them on a deck, they were spared from the last hail storm. Her little veggies got shredded a little before salad season. I seriously can’t believe that this process is working! My lettuce, eh…. Carrots – they are taking a long time – delayed gratification and they grow down. I can’t see their progress. But I sure do put hope in these little tomato plants. Oh the metaphors, the lessons that vegetables can teach us. I could do a whole extended metaphor thing here, but I don’t think that’s the direction I want to move tonight. Instead, I’d rather focus on Chickens. Felted Chickens. Look how cool this little guy is. He has tons of friends, and the artists that make these guys were so wonderful! This is truly not something you see every day. Take a moment to learn more about the artists The CitygirlFarm. You know what’s funny? I’m not sure why these caught my attention because frankly, I hate birds. But these were so innovative, and pretty, and I, for some reason or another, am drawn to fiber arts. 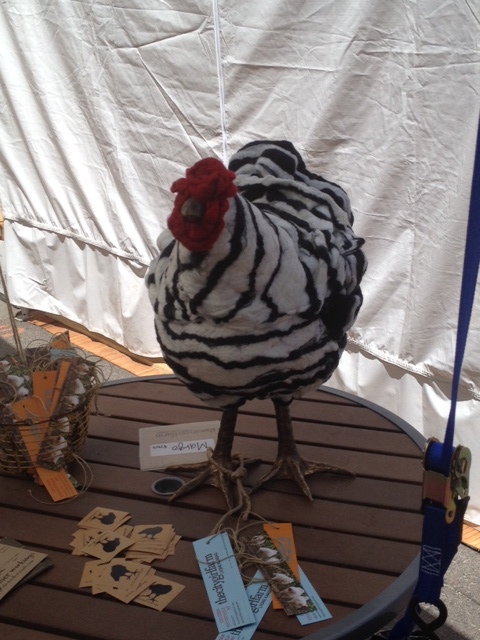 Funny, too, because who thinks of resting their feet on chickens? This weekend we got to go to the Cherry Creek Arts Festival in Denver – a favorite of mine each summer. I love walking around the ritzy neighborhood, thinking about how some day, just maybe, I will be able to purchase some original art for the walls of my home. I usually just collect business cards, and hand outs that the artists share their contact info on. Free art! Even if it is in miniature. I love looking at how artists spend their time and creative efforts. How refreshing it is to think about how people choose to break out of the every day monotony of paying bills, worrying about what’s next, and instead channel efforts into different mediums and landscapes, and lines and textures. How freeing it can be; to express yourself on canvas. Or wire. Or sculpture, Or paint. I did a lot of art in high school – somewhere along the line I got afraid I wasn’t good enough. I was traumatically affected when my high school teacher told me my work didn’t have a theme, that the connection wasn’t strong enough through my threads of pieces. As a perfectionist, this hit me hard. I’m better now, but still think I should dabble more into art. There is beauty in choosing to create regardless of what the critic thinks. My new line when I don’t quite understand someone else’s hobbies, or maybe am just a little jealous that I haven’t honed my own true talent yet, is “find your passion.” Well Thecitygirlfarm certainly found their passion – and they got to share it with me – and I love it! And this weekend, at the art festival, it seemed just like all those people were doing just that. I love the beautiful conversations art invokes, the way artists open their eyes and shift their perspectives and are brave enough to put their view into form, and offer it up to be sold into people’s homes. That is such a beautiful combination – vulnerability, perspective, artistic truth, culture. How wonderful. Below are some of my favorites from the festival. Check them out. What questions do they make you ask? What’s your passion? Chris Dahlquist – the business card title is “object maker” – what a wonderful title! Liz Quan – the coolest porcelain lights ever! And she works in Colorado!